The serialization of literature began as early as the 17th century but it reached its zenith in Britain in the 19th century. Throughout the Victorian period, novels in serial parts were published in abundance in newspapers and magazines, by far the most popular form, or in discreet parts issued in instalments, usually twenty monthly issues. Serial publication enabled middle class readers to purchase novels that would be too expensive for them to purchase as a single edition. Most monthly part issues sold for about one shilling, meaning the cost of a novel could be spread out over a year and a half. Magazines and newspapers were even more affordable and many offered two or more novels running concurrently. Illustrations were also an important feature of serial novels and Victorian artists, like John Everett Millais, were well known for their illustrations for serial fiction. Advertising also appeared in magazines and newspapers and in monthly part issues. Serialization affected the form of the English novel. Each chapter had to engage the reader as a single unit as well as working within the context of the whole novel. Authors adopted various strategies to cope with tight deadlines and other challenges of the form, such as the requirement to produce parts of a uniform length. Some wrote the complete novel beforehand and submitted all the monthly parts together. Others let the novel evolve with each part. In such cases, the story could be interrupted or delayed by illness. It was also important not to introduce any element to the story that a Victorian audience might find offensive as many periodicals were aimed at a family audience. Part issues eventually fell out of favour as magazines became the preferred format and inexpensive one-volume reprints of original novels became available. Many 19th century authors established themselves by first publishing original fiction in serial format. Charles Dickens, Wilkie Collins, George Eliot, Elizabeth Gaskell, Thomas Hardy, George Meredith, Robert Louis Stevenson and more, all published serial novels, either in monthly magazines or as discreet serial parts. Charles Dickens popularized the part serial format, beginning with his first novel, the Posthumous Papers of the Pickwick Club (1836-1837), one of the serial novels digitized as part of the Victorian Serial Novels collection. Pickwick was not well-received until the fourth issue when sales soared to 40,000 in one month. 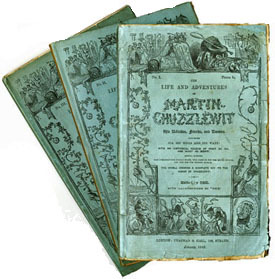 Dickens subsequently published eight other novels in part issue format, including Martin Chuzzlewit (Jan. 1843-Jul. 1844), Dombey and Son (Oct. 1846-Apr. 1848), David Copperfield (May 1849-Nov. 1850), Little Dorrit (Dec. 1855-Jun. 1857) and Our Mutual Friend (May 1864-Nov. 1865). The Virginians (1857-1859) by William Makepeace Thackeray. Johnson, E. D. H. Charles Dickens: An Introduction to His Novels. Dickens' Professional Career. The Victorian Web. 25 Aug. 2010. Payne, David. Reenchantment of Nineteenth-century Fiction: Dickens, Thackeray, George Eliot, and Serialization. New York: Palgrave Macmillan, 2005. Palgrave Connect. Web. 25 Aug. 2010. Vann, J. Don. Victorian Novels in Serial. New York. Modern Language Association. 1985. London Low Life database of "street culture social reform and the Victorian underworld." Discovering Literature: Romantics and Victorians. Digital resources at the British Library.